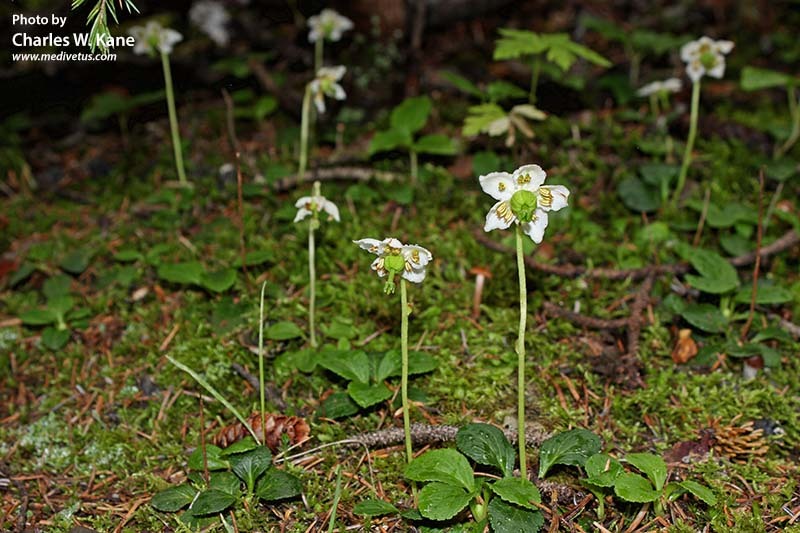 Single Delight, the sole member of the genus Mon­eses, is a unique looking plant that resides in moist forest soils in shady wooded areas throughout Alaska. Its single white flower towers three inches above the ground, looking down­ward as if to illu­mi­nate all things below. This growth habit inspires other common names like Frog’s Reading Lamp and Shy Maiden. Indications—feeling isolated and alone, especially during a dark or depressing time; sadness after moving and leaving friends behind; unable to sense or feel the connection with one’s soul family. Healing Qualities—When one catches a glimpse of a Single Delight flower in a shady forest glen, it appears to glow with its own inner light. This signature suggests a strong connection to lunar, rather than solar forces, and symbolizes the power of light that shines in darkness. Single Delight is for those who feel alone and separate, and are trying to find a connection with others through the perceived darkness and isolation of their present experience. This essence teaches us that these feelings of separation can be healed by opening our hearts, and that the experience of isolation is itself a result of our perceptual abilities not being used to their full capacity. Single Delight helps to clear our inner vision so that we may see and feel the network of light that energetically connects us with all other living beings. It shows us that this light is always available, always shining, even into what we may consider to be the most shadowy realms of our existence. Its vibration opens our hearts and brings a remembrance of the support we have always had, helping us replace our feelings of isolation with a factual energetic experience of connectedness with life. The essence of Single Delight is particularly useful for those who are on a path of service that requires them to travel a lot or frequently move to a new location. This activity often brings up painful emotions associated with leaving friends and loved ones behind. Single Delight brings balance to this situation by opening our awareness of the reality of connectedness beyond the physical; connection that is not limited by time and space. With this awareness the pain of separation can be felt within the stability of a network of light that exists and is maintained by one’s soul family, wherever they might be.